Transferring data to and from Salesforce is not very difficult. 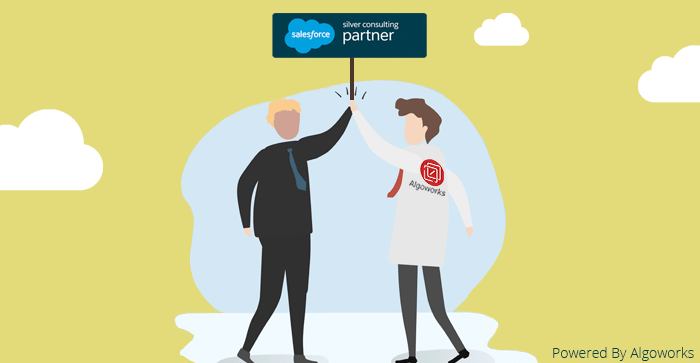 Salesforce data import wizard and Salesforce Dataloader.io tools made the job of data migration a rather point-and-click process. However for repetitive, complex, or large scale data transfer operations, these tools become too cumbersome. Capitalizing on these shortcomings, and at the same time providing a better and easier way to integrate two or more systems, numerous tools have been launched in the market by both new and old data integration players. Talend is one such player with a great portfolio of data integration and migration offerings that can be used to migrate data to and from Salesforce. Talend data integration and migration tools are not new. Talend has been around for quite some time and has been gaining reputation and popularity steadily. The free data migration tool Talend Open Studio, is even popular among our Salesforce developers. 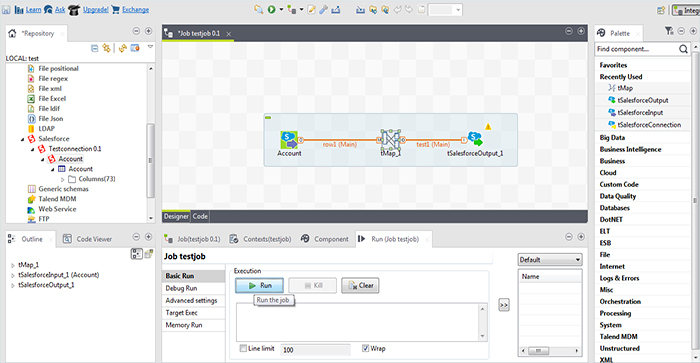 The Talend tool in its essence is a code generator tool. For every task, it automatically creates a code corresponding to it that can be run either in the Open Studio tool itself or any other compiler you desire. Most prefer the Open studio itself, but you can always export the code to use in any other program that you want. In addition, this tool gives you options to modify your job parameters and queries giving you more flexibility in creating codes. Speed: It’s very light weight and hence has slightly better processing speed. But unless and until you have magnanimous amount of data, the speed won’t matter much. A huge community of supporters. Around 800 inbuilt connectors and has support for all major new technologies like AWS, Salesforce etc. 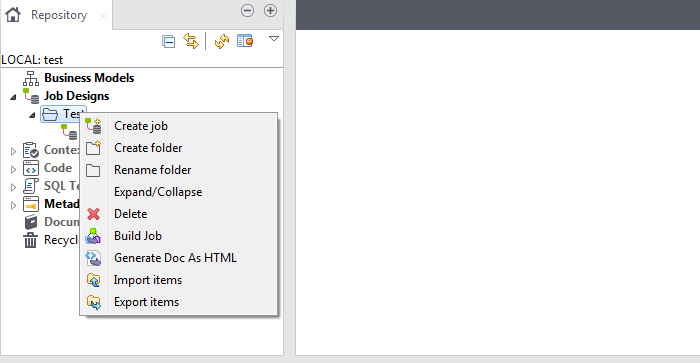 Talend, as we said before, is very easy to use. You do not need to be an expert in coding to use it. 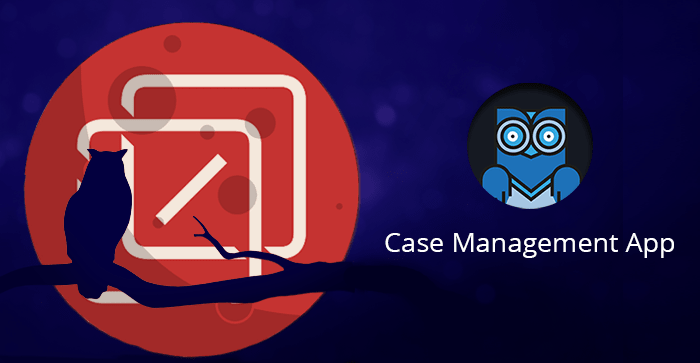 Here is a step by step process on how you can use it for migrating data to and from you Salesforce org. 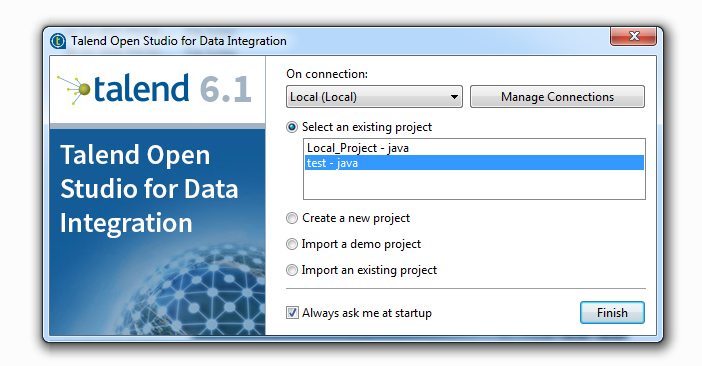 you can download and install Talend Open Studio Data Integration tool from this link. https://www.talend.com/download/talend-open-studio#t4. You would need Java Runtime Environment to run the tool. The first step is to open Talend and create a new project. You can create a local project with default credentials or you can access a cloud hosted project through proper login and password. Once you have opened a new project, the first step is to create a new job. In the left side panel labeled Repository, you will find an entry named Job Design. Right click on it and create new Job. It’s a good idea to organize jobs so I would advise you to create folders. Creating a new job will open the Job Designer panel. Now this is the step where you may feel the advantage of 800+ connectors. 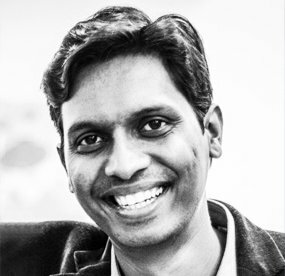 Talend has inbuilt metadata connector for Salesforce. 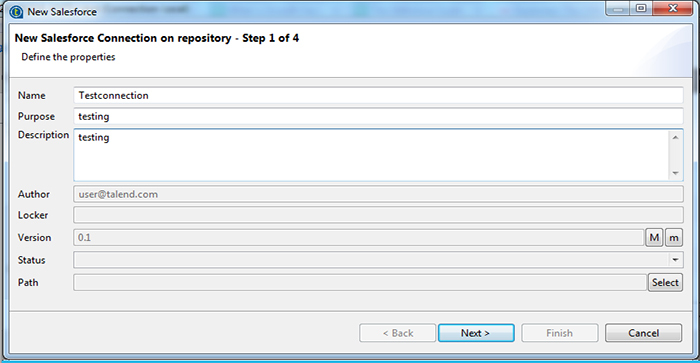 First expand the metadata section in the Repository panel. 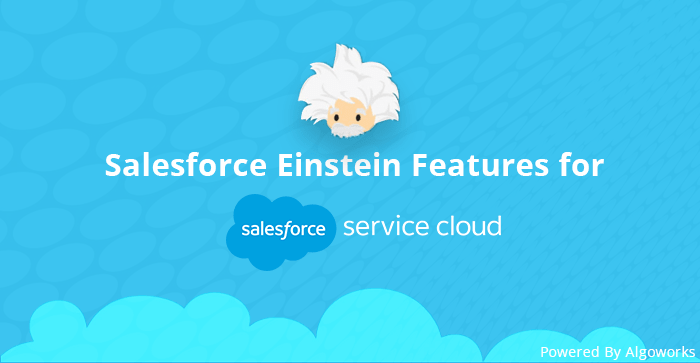 Then find Salesforce in the expanded section, right click and select Create Salesforce Connection. 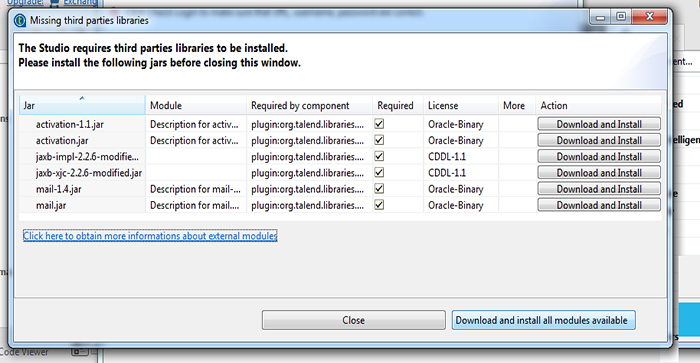 This may prompt the software to install additional modules. Once installed add in the necessary details. 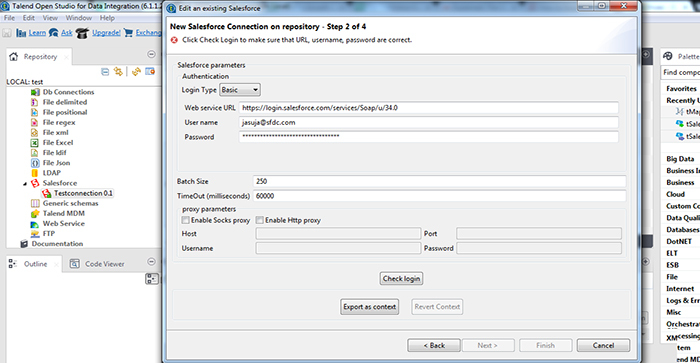 You would have to append your present password with your Salesforce security token for a successful connection. 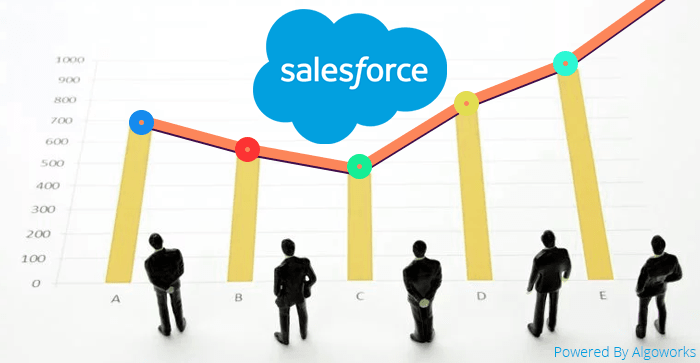 This will create a new connection and you can retrieve all Salesforce modules by right clicking the connection and selecting retrieve Salesforce module. 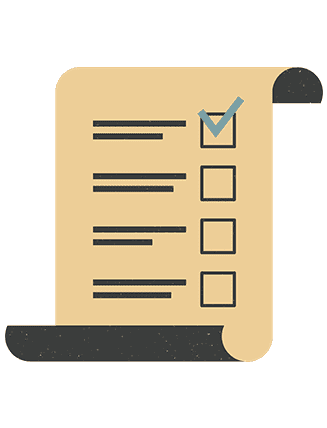 This will list all the standard and custom Salesforce modules which you can retrieve by selecting them from the list. This action will retrieve all the columns of the module. Once you have created your Salesforce connection, you can drag and drop the connection to the Job Designer panel. 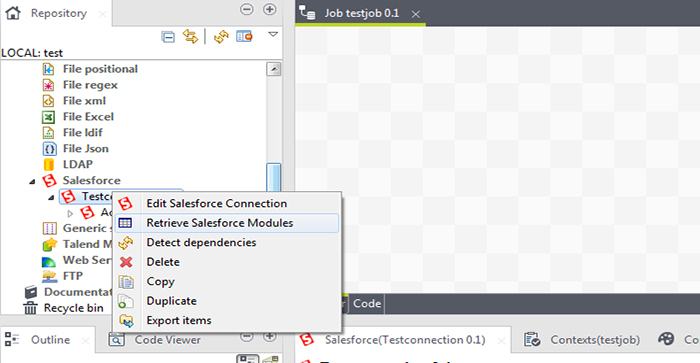 When you will click on the connection in the job designer screen, you will see all the important settings associated with the component on the screen just below the job designer. These settings define the action that you would be performing on the object. The type of connector you choose will define the input and output operations. You can also create a new connection by dragging a connection component from the right side panel labeled ‘Palette’. 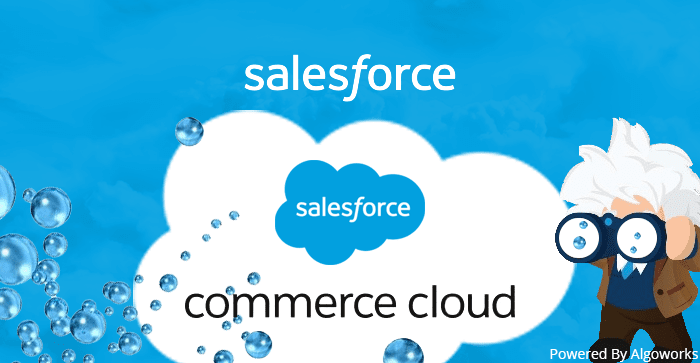 Go to Cloud-> Salesforce-> SaleforceOutput. Drag and drop the component to the job designer. Then click on the component and edit its basic connection settings. Now once you have created an input and output component, all you have to do is to click on the small red arrow on the side of the input component and drag and drop it into output component. Connecting components this way will only work perfectly when you don’t have to map the data for proper transfer. For example, when you may have to transfer Salesforce data to a new MySQL database or a new excel file. 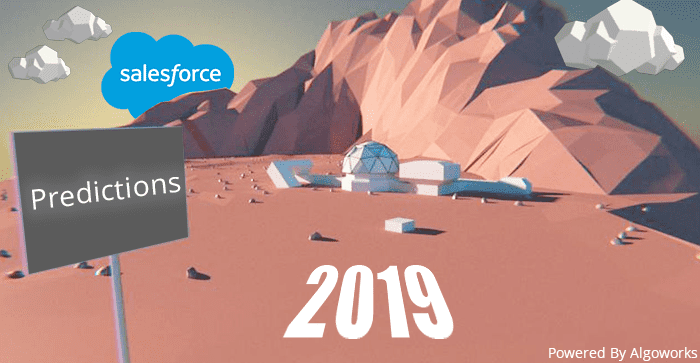 But when you may have to do a little complicated data transfer, like for example transferring data of a custom module from one Salesforce org to another, you may have to use tMap component. This component can be found in the ‘Process’ menu in the Palette. 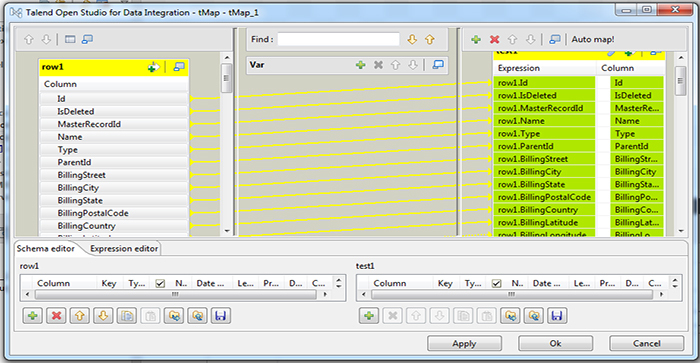 Drag and drop the component in the job designer, and connect the input component to the tMap, and then connect tMap to the output component. Double clicking the mapping component will open the mapping screen, which again has drag and drop features, as well as auto map features. Trust me it’s super useful. That’s it. You are done. All you have to do now is to run the job. There are multiple ways by which you can run the job, like by right clicking the Job and selecting ‘Run Job’ in ‘Repository’ panel, or by clicking the Run Job in the component detail panel below the job designer panel. Now this type of stuff is basic and can be done adequately by Data Loader desktop tool (not dataloader.io tool). 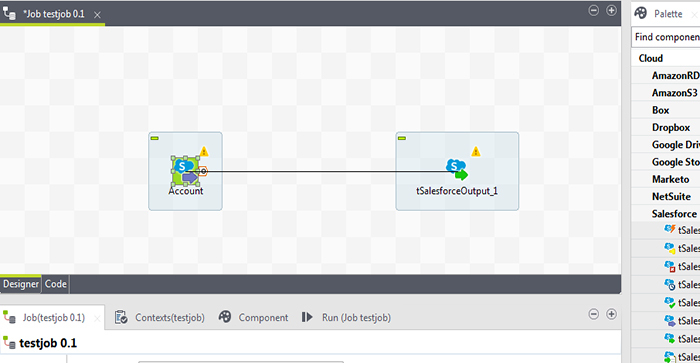 But the real beauty of Talend comes when you have to include Lookups according to external data or running complex data transfer jobs involving multiple related data objects. Hey this was very useful however, when loading data on regular basis, how to check for dupes – is there any pallet in talend to match the data in Salesforce prior to loading?